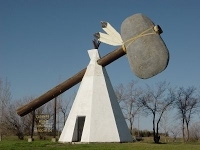 The Tomahawk was constructed in 1971 as part of Saskatchewan’s Homecoming celebrations. It represents cooperation between the area’s local cultures. The tipi, a traditional First Nations shelter, symbolizes respect, humility, faith, and sharing. The Tomahawk, or stone tool, was used to build and create as well as to destroy. The original structure consisted of a pre-cast concrete tipi, a Douglas Fir handle and a fibreglass blade. In 2006, the wooden handle was replaced with a metal one. It has been recorded by the Guinness Book of World Records as the World’s Largest Tomahawk. The Tomahawk is situated at the south end of Tomahawk Park on the west side of Cut Knife. The Clayton McLain Memorial Museum is on the north end of the park. The two are joined by a paved walking path. Reservations are not accepted: It’s a ‘first come, first choice’ system. Payment is required before occupancy and can be taken care of at the Town Office on Broad Street. Please note that dogs must be on a leash at all times.